First, a confession: My foremost reason for writing this post is so I can embed a really cool infographic about Google on my blog. But the fact that I want to do it reflects the power and beauty of infographics. A good infographic combines the visual splendor of print with the accessibility and engagement of the Web. Used well, it can give information an appeal and interactivity that even the best prose cannot match. It encourages your readers to dwell on data they would otherwise skim over. Granted, infographics of this quality are not easily produced. “Google’s Collateral Damage,” for instance, was produced for SEO Book by infographic specialist Jess Bachman, and presumably did not come cheap or without many hours of planning. But something as simple as a map or an annotated photograph can qualify as an infographic and enhance the effectiveness of a story. Yes, stock photography is easier. But as Heather Rubesch noted earlier this week, stock art has more than a few downsides. Though it will entail greater effort, a relevant infographic will add far more value. Infographics are not unique to the Web (magazine consultant Howard Rauch has promoted their use for years). But in this new medium, they have more power, reach, and value. If you ignore them, your future as a journalist is at risk. When the Huffington Post hired journalism student Chris Spurlock recently, it wasn’t because of the novelty of his infographic resume. It was because in the Web era, the ability to think in both prose and graphics is an increasingly critical skill. 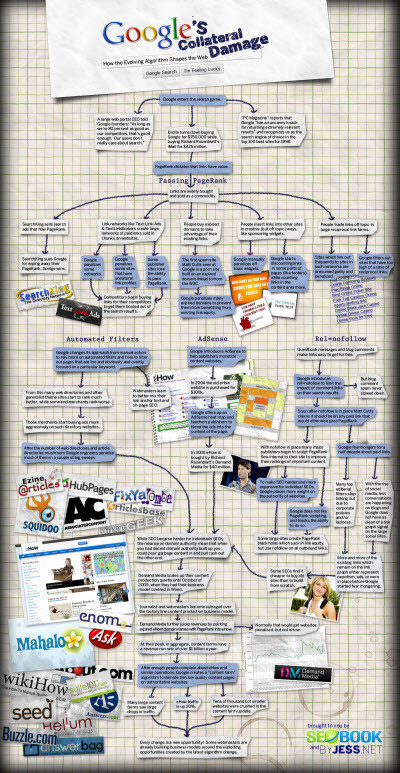 So journalists, content marketers, and writers alike take note: Infographic skills are no longer optional. Interesting post. How ’bout some tips on getting started? Good idea. Let me see what I can do. In the meantime, perhaps other readers can offer up their own tips. Pingback: links for 2011-03-28 » Wha'Happened?